Going the Distance is a short, non-linear adventure for Cyberblues City involving crime bosses, boxers and cyborg bears. 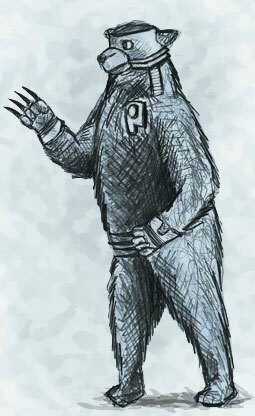 And here’s the cyborg bear I mentioned. The new Deluxe edition includes a brand new, off-the-wall setting, Cyberblues London and all new artwork. I’m very lucky. Somehow I’ve managed to write, publish* and sell three half decent game systems – Golden Heroes**, Squadron UK and The Comics Code (et al). That should be enough for anyone and I really should settle down to refining what I’ve already got and producing supplemental material for it. But, no, I’ve got a yearning to write something else. A game halfway between by full-trad stuff (SqUK) and my lightweight “Code” games. Something truly multi-genre. 3) A superb front cover. As soon as you start promoting the game, you need something for people to lock onto. It doesn’t matter how good your game is inside the book, the first impression people get is the Cover. It has to tell readers about your game in a single glance and convince them to read the blurb. I’ve been blessed with the two artists who have done my covers (Dave Eadie and Shane Mitchell). But I’m about to go around play-testing it and conventions want a NAME to put on their web-sites. Also casual players will be more likely to sign up for a game of “Unbounded” as opposed to “Simon Burley’s new RPG”. So, yes, I came up with the name “Unbounded” just as a placeholder on websites etc. only to be contacted by a fellow designer who has been working on a game with a similar title. Not being wedded to the title, I’m now going to change it but coming up a new one is proving hard. I came up with a new one but a quick web search has shown it’s already been used. This is the first time in over thirty years of writing RPGs that I’ve found it this hard. To be honest, I never liked the title “Golden Heroes” anyway! ** GH was co-authored by Pete Haines, a design genius who came up with many of the original ideas. In fact, he also came up with the Squadron UK tag for one of his Superpowered teams for GH – which I later appropriated for my second game. Golden Heroes: because the first two Superhero RPGs (Superhero 2044 and 1st Ed. Villains and Vigilantes) didn’t simulate the comics. Squadron UK: anger when Games Workshop sent me a “cease and desist” letter when I tried to resurrect GH. The Comics Code: So I didn’t have to carry loads of kit to Conventions in Scotland and Dorset. I can now take everything I need in a single piece of hand luggage, meaning I can fly up to Scotland. Also to fit in the shorter game slots favoured by many conventions.